There is something unencumbered and unassuming about the clean lines of the Tarvos. The idea behind the Tarvos is to utilize a traditional meeting format and make it live within today’s office lifestyles. At 90 Degree Office Concepts, we have stripped away all of the ornate clutter of yesterday’s offices, and provided an elegant simplicity, as indicated by the square-edged top of the Tarvos. Available in choice wood combinations. Though imbued with contemporary furniture design, the Tarvos is not all about form. The Tarvos offers a wide selection of power/data/ and communication options. Speak to your design consultant to select the options best-suited to your meetings. The Tarvos is shown here in 14' x 4'. 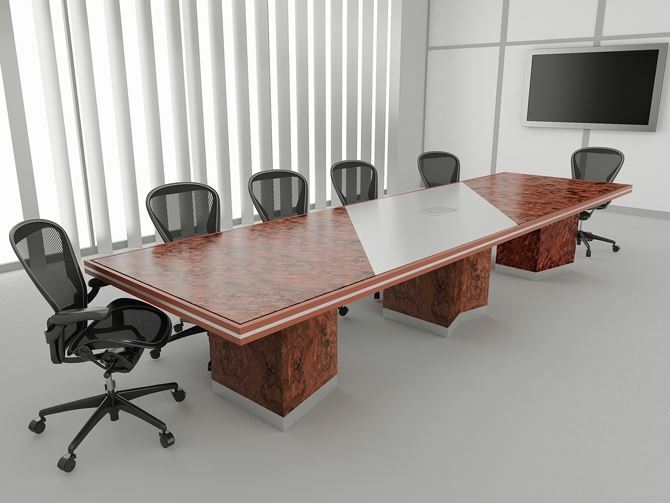 The tabletop center displays a brushed-metallic overlay flanked with mahogany burl wood veneer. The table’s hardwood edge bands the combined wood/metallic surface and complements the surface elements. The Tarvos' bases remain consistent with its modern image, with two opposing tapered profiles centered with complementary lines. 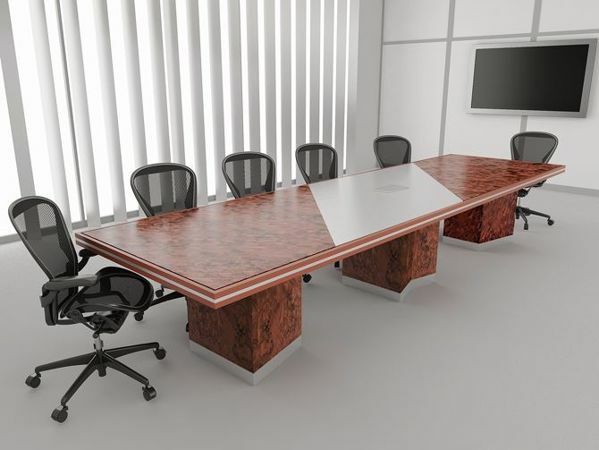 The Tarvos is a uniquely modern conference table that will enhance the appearance of any meeting. Your experience of its clean lines, visual simplicity, and modern flair will set your workplace apart as one to be appreciated in the minds of your team members and outside collaborators. Power/data and communications options are available, as shown, in a plethora of combinations and details. Available table width: 42", 48", and 60"